From The Asian Reporter, V17, #20 (May 15, 2007), page 21 & 24. Kenji Mizoguchi was one of Japan’s finest directors, making over one hundred movies in a career that began in the silent 1920s and ended in the mid-’50s with sound films shot in full color. That Mizoguchi spanned such a broad spectrum of cinematic technique is in itself remarkable, but his prodigious output of classic films throughout makes him even more of a giant. In the Northwest Film Center’s calendar of "Mizoguchi Masterpieces," you could throw a dart and hit a movie you shouldn’t miss — choosing the best of them is like selecting a favorite child. However, his film Ugetsu should make anyone’s top-10 list of greatest Japanese films, and should be ranked among the best films from any country. Made in 1953, Ugetsu combines a love story with a ghost story and sets them both against the chaotic backdrop of Tokugawa era Japan, when civil wars were rife and the armies of rival feudal lords swept back and forth across the country in destructive waves. As important, however, is the era in which the movie was made, when the psychic toll of World War II and its aftermath was only just being understood by the Japanese people. Unlike the epics of Kurosawa, which tell Shake- spearean tales of proud lords and their tragic downfalls, Ugetsu looks at the peasants caught in the crossfire of the warring nobles. The result is a combination of fantasy and fable that speaks to audiences of any era about the dehumanizing effects of war. Ugetsu warns not of its physically destructive forces, but of the collateral damage that is inflicted on our values, by romanticizing death in battle and encouraging wartime profiteering. The plot of Ugetsu follows two dreaming farmers in a rural village: Genjuro (Masayaki Mori) also makes pottery, and knows that war means a higher price for his wares; his brother-in-law Tobei (Eitaro Ozawa) dreams of samurai glory, even though he lacks both equipment and martial skill. In spite of the protests of their wives and the ominous warnings of the village elder, the two men sell Genjuro’s wares in a nearby village and make a healthy profit. Blinded by their sudden wealth, Genjuro races to make more pottery, while Tobei helps him, knowing that he can buy samurai armor and a spear with his share of the sales. Narrowly avoiding conscription by soldiers, the men finish their pottery and leave for a more distant city, this time accompanied by Tobei’s wife Ohama (Mitsuko Mito). Genjuro’s wife Miyagi (Kinuyo Tanaka, who would become Japan’s first female director) remains behind with their son, even though this means she must contend with the lawless soldiers who still roam the countryside. It will not be the first time that the men disregard their families for money or glory, and this blindness to the important values in life is at the moral center of the film. Although the three reach town safely, they are quickly separated by their different fantasies. Tobei races off with his profits to buy armor and weaponry, and Ohama tries to follow him. 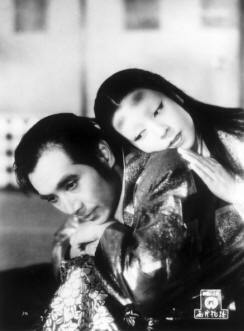 Genjuro becomes dazzled by a beautiful princess dressed in white, Lady Wakasa (Machiko Kyo), and soon abandons thoughts of home and family for the life of luxury she offers him. Tobei seems to achieve his martial goals, only to find that he has lost even more in the process. When both men discover that their wildest dreams are more farfetched than they ever imagined, they try to recapture their old, simple lives before it’s too tale. Mizoguchi easily blends reality and illusion, and such is the flawlessness of his cinematic ability that we never notice the seams between the two. Each shot is planned and framed meticulously, and he coaxes supremely moving performances from the entire cast. Likewise, the twin plotlines of Genjuro and Tobei are perfectly balanced, complementing and contrasting one another without confusion, pointing together towards a meaning beyond the film’s antiwar stance. Though the film is structured like a fable, Mizoguchi slips the moral in effortlessly, so that Ugetsu feels neither preachy nor didactic. Instead, we are left with a cinematic gem, flawless in concept and execution, a deceptively simple film that remains with us far longer than flashier war epics ever could. Ugetsu will be shown on Thursday, May 17 at 7:00pm at the Northwest Film Center’s Whitsell Auditorium, located at the Portland Art Museum (1219 S.W. Park Avenue, Portland). For more information, call (503) 221-1156 or visit <www.nwfilm.org>.